Last spring, Anthony Peruso was manning the goal circle as goalkeeper at Wagner College. Now, Peruso has traded in his stick for a whistle, as he is coaching one of South Jersey’s up-and-coming boys’ lacrosse programs. 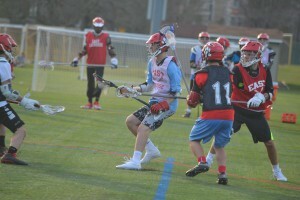 Less than a year after completing his college lacrosse career, Peruso was hired this winter as the head coach for Cherry Hill High School East boys’ lacrosse. Peruso is taking over a program coming off its best season ever. Peruso is a new face in South Jersey. He moved to New Jersey last year after getting a job at NXT Sports in Philadelphia after graduating college. Peruso was interested in coaching at the high school level after. When he saw the Cherry Hill East job was open, he knew it would be the perfect opportunity. While Peruso is new to coaching, he brings a ton of playing experience with him. Peruso has played lacrosse since he was 10 years old. Having played so recently, Peruso feels he has a good pulse on the sport today. Peruso has worked on a number of things leading up to his coaching debut. He’s worked on strategy in game situations, an area he feels he’s very prepared to deal with. Peruso admits he is trying to work on being vocal and explaining plays and techniques to his team. However, he enjoys being a leader, saying it’s similar to when he played at Wagner. Peruso brought a family member with him to Cherry Hill East to help him out in his first season. John, Anthony’s older brother, is the assistant coach with the team. Anthony believes having his brother with him on the sidelines will give them an advantage. Peruso is hoping to make Cherry Hill East a perennial contender after the team had its most successful season in program history last year. In 2015, the Cougars started the season 7–0 and went on to win 12 games, the most in program history. Cherry Hill East also won its first-ever playoff game against Rancocas Valley in the first round of the South Jersey Group IV playoffs. The key for this season will be keeping mistakes minimal. In the preseason, Peruso preached to his team the importance of fundamentals. Peruso doesn’t see the Cougars’ success last year as a fluke. He is confident the team is going to set a new high for wins in a season again this year. “I have absolutely no doubt we’re going to be able to go toe-to-toe with any competition,” he added.